The world's favourite American salad now comes grilled, straight off the barbie. Serve with oven-crisped slices of baguette brushed with garlicky olive oil. 1. To make the dressing, whisk the mayonnaise, garlic, anchovy, mustard, sugar, lemon juice and parmesan, then gradually whisk in the olive oil (or whiz everything at high speed in a mini processor). 2. Heat a ridged cast-iron grill or barbecue. Cut each lettuce in half lengthwise and brush the cut sides with olive oil. Place cut-side down on the grill for one minute, or until grill-marked, without overcooking. Arrange cut-side up on a serving platter and top each half with an anchovy. 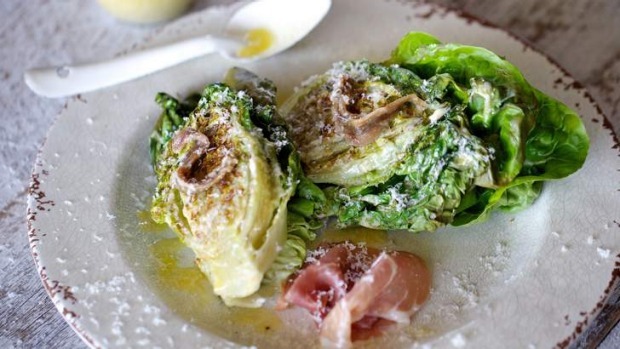 Tuck in a furl of prosciutto, spoon over the dressing, scatter with grated parmesan and serve.